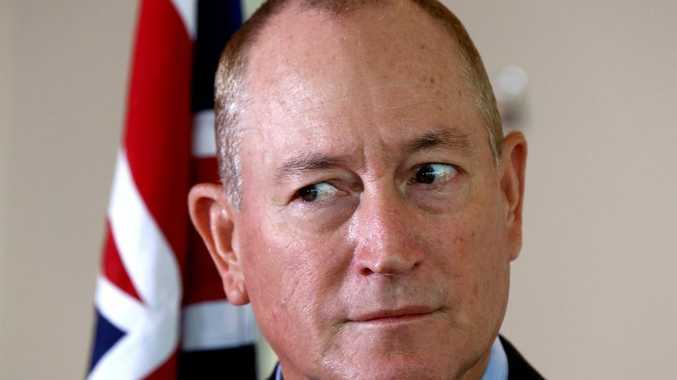 QUEENSLAND Senator Fraser Anning has been widely condemned for his "disgusting" comments in the wake of the fatal Christchurch mosque massacre. 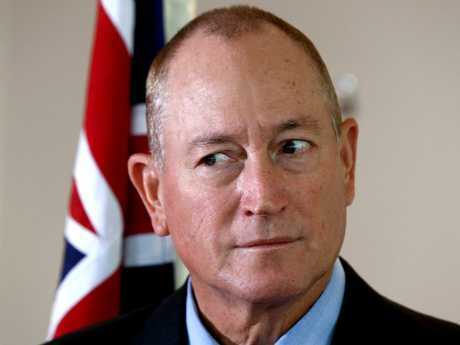 In a media statement issued this afternoon, Senator Anning said the attacks highlighted the "growing fear over an increasing Muslim presence" in Australian and New Zealand communities. He went on to claim the real cause of the bloodshed that's left at least 49 people dead is New Zealand's immigration policy. 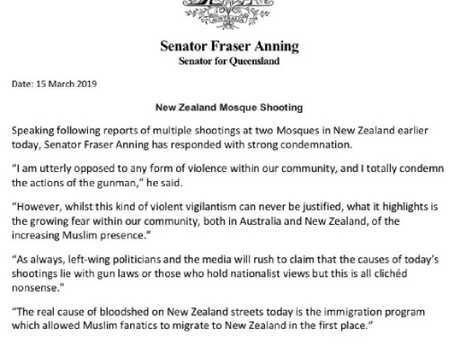 Part of Queensland Senator Fraser Anning's statement on today’s horrific events. "I am utterly opposed to any form of violence within our community, and I totally condemn the actions of the gunman," Senator Anning said. "However, while this kind of violent vigilantism can never be justified, what it highlights is the growing fear within our community, both in Australia and New Zealand, of the increasing Muslim presence. "As always, left-wing politicians and the media will rush to claim that the causes of today's shootings lie with gun laws or those who hold nationalist views but this is all clichéd nonsense. "The real cause of bloodshed on New Zealand streets today is the immigration program which allowed Muslim fanatics to migrate to New Zealand in the first place." Senator Anning went on to say that while Muslims may have been victims of attacks, he claimed they were also perpetrators. and blamed deaths on "the entire religion of Islam". "It is the religious equivalent of fascism," he said. He ended with a passage from the bible and said those who followed a violent religion that called on them to murder "cannot be too surprised when someone takes them at their word and responds in kind". A media adviser for Senator Anning told news.com.au there had been no backlash to the statement, but it only took minutes for social media to blow up in outrage. Among the criticism was a rebuke by Prime Minister Scott Morrison, who described the statement as "disgusting". "The remarks by Senator Fraser Anning blaming the murderous attacks by a violent, right-wing, extremist terrorist in New Zealand on immigration are disgusting," Mr Morrison said. Labor Opposition Leader Bill Shorten also slammed the "obscure" Senator. "While families in Christchurch mourn for loved ones they've lost, an obscure Australian Senator saw this act of terrorism and tragedy as an opportunity to blame the murder victims," Mr Shorten said. "He deserves the contempt and condemnation of decent people everywhere. He does not speak for our parliament or our country." On Sky News, political journalist Kieran Gilbert said someone with those views did not belong in parliament. "I find him absolutely disgraceful," Gilbert said. "It's disgusting." British journalist Piers Morgan also lashed Senator Anning, saying he felt "blind fury" at the remarks. Many chose not to share the statement at all. "No, but we do see the link between certain senators and violence," wrote one man on Twitter. "Please don't do this today. Show some dignity and compassion. You might find you like it." Another wrote: "Fraser Anning is a bad person in his heart. Just a nasty, ugly waste of human life." 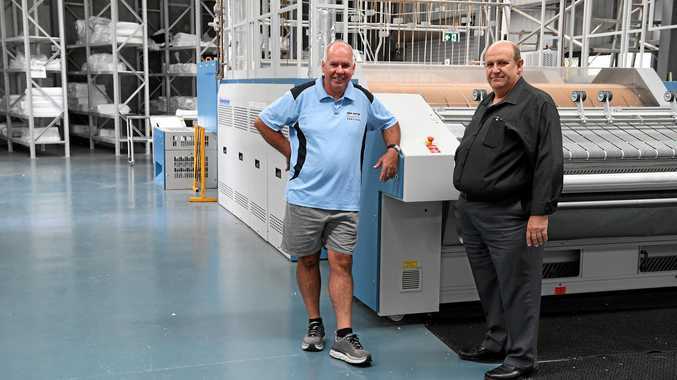 Queenslanders said they were "disgusted" the politician represented their state. "You are just appalling," wrote another. Others who supported his sentiment were also slammed. Following the backlash, Senator Anning has continued to defend his comments. In another tweet he doubled down saying Friday was not an "excuse" to forget lives lost to "Islamic terrorist attacks".